It’s time to rewind the history books and set off to the fictional island of Avalon which was the location where King Arthur’s Excalibur sword was forged and also where he escaped to after the Battle of Camlann in order to heal the wounds that he received. In keeping with the mysterious island, there is equally mysterious music that plays in the background as you spin the reels. Unfortunately the design doesn’t match the drama of the music as the symbols are very simplistic and don’t really do the theme justice – especially when you compare it to its sequel, Avalon II. Fortunately it’s a low variance slot machine that boasts a 97% return to player percentage (unsure what this means? Check our slots terminology page) along with a maximum win of 105,000 coins – which certainly feels feasible due to the Lady in the Lake free spins feature. You don’t need pockets as deep as a King either as coin values range from 1p to £1 and with one to ten allowed to be bet per payline, this means a minimum and maximum bet per spin of 20p and £200 respectively. For such a historical slot machine I was rather surprised and disappointed by the simplicity of the symbols featured in Avalon, with twelve included in total. 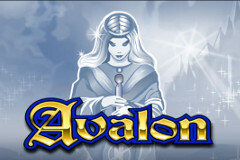 The highest valued symbol is a view of Avalon from afar which is the slots Wild symbol and therefore substitutes for all others except the Scatter and five on a payline pays out 3,000 coins. There is also a shiny golden treasure chest which substitutes for all of the other symbols throughout the free spins mode apart from the Scatter, plus landing five on a single payline will see you credited with 1,000 coins. The Scatter is the Lady in the Lake and this is required for the free spins mode, while King Arthurs crown, a coat of arms, a broach, silver chalice, and standard Ace to 10 icons you normally associate with video poker games complete the range of symbols you’ll see on the reels. Aside from a simple gamble feature, Lady in the Lake free spins is the only other feature to entertain you in Avalon, however the generosity of it more than makes up for that. Triggered by landing three or more of the Lady in the Lake Scatter symbols anywhere on the reels, it sees you rewarded with an initial 12 free spins however these all come worth a multiplier bonus attached worth between 2x and 7x – a factor that dramatically boosts your chances of King sized wins. To top the feature off you can actually retrigger the feature by landing three or more Scatter symbols again it plays out, a feat that will see 12 more free spins added to your counter. As with most Microgaming slot machines, Avalon contains a Gamble feature, and it is much needed to turn those frequent small wins into larger ones that make your efforts worthwhile. Interestingly it’s not just a heads or tails coin flip, instead it’s based on playing cards and offers you the opportunity to either double or quadruple your base game wins. In order to double your winnings you simply choose whether the next card will be red or black, while to quadruple wins you must decide which suit it will be – either heart, diamond, spade, or club. Of course, after doubling or quadrupling your winnings you can continue risking to increase it further, but tread carefully as one incorrect choice sees you lose it all. Unfortunately the Avalon slot machine is very simplistic and there isn’t much reason to play it. There are thousands of online slot machines available that are jam-packed with bonus features, and the sequel Avalon II quite simply blows it away. Saying that, the lure of the Lady in the Lake and her generous free spins mode is very attractive. The fact that you receive 12 free spins and can enjoy a multiplier as large as 7x makes could certainly see you rewarded with some King-sized wins – pun intended!